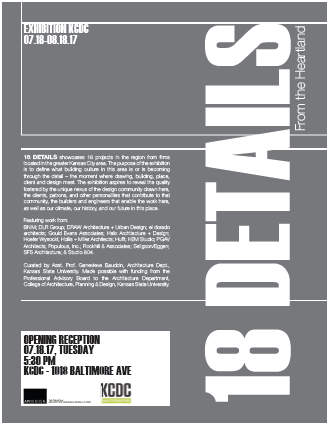 18 Details on exhibit at the University of Kansas School of Architecture, Design and Planning – 3/26/18-4/12/18! Baudoin receives 2018 Commerce Bank and W.T. Kemper Award for Outstanding Undergraduate Teaching at K-State! Here is the link to the press release! Genevieve’s paper focused on the work, process, and critical approach of artists Robert Smithson, Donald Judd, and Gordon Matta-Clark – these artists were used to frame our own approach to practice. Baudoin’s student Kasey Holle from her 4th year studio at K-State wins MANKO Award! Kasey won the sixth annual MANKO Design Competition for her KC Film Institute for the Crossroads, Kansas City. 18 Details on exhibit at the Cassias Gallery at K-State – 11/6-11/30/17! Baudoin presents 90 Lines: Decoding Liminal Space at the 2017 Fall Conference for the Association of Collegiate Schools of Architecture in Marfa, TX: Crossings Between the Proximate and the Remote. Genevieve’s paper focused on the translation process of the spatial conditions presented in 90 Lines, particularly the links between experimental music/art notation and site/tectonic notation in architecture. BIENNIAL-600: ARCHITECTURE is the seventh in an ongoing series of juried biennial exhibitions at the Amarillo Museum of Art, exploring specific areas of artistic practice, material, and/or content, using the museum’s exhibition spaces. This exhibition was intended for architects and artists working at the intersection of art and architecture. The exhibition was juried by Rand Elliott, FAIA, Elliott + Associates Architects, Oklahoma City. Site is not a term exclusive to architecture. Site occupies a contentious zone as it (and the design field) expands and blurs between objects and their surroundings. “The Layered Landscape" will share author/architect Genevieve Baudoin's work in her collaborative practice, Dual Ecologies, by comparing both built and unbuilt projects of varying scale and intent, where the typical dichotomy of the designed object and its surroundings are questioned through modes of representation, perception, materiality and program. This presentation examined the methodologies and work produced in the Spring 2015 5th Year MArch Regnier Chair Studio, co-taught with Steven Ehrlich, founder of the 2015 AIA Firm of the Year, Ehrlich Architects (additionally, recent graduate Dain Susman received the 2015 Heintzelman Prize for his project in the studio). The LA River served as a framework for the studio - the water systems existing in LA today are an incredibly complex processing network negotiating the terrain between supply and waste. The new LA River Revitalization Plan (LARRMP) acted as a springboard for the development of the 14 students’ individual programs and site selection – the 31-mile plan intends to essentially restore aspects of the river ecology and identifies 20 key opportunity areas critical to bringing the River to the center of life in Los Angeles. The students traveled to Los Angeles to hear from key players in the Revitalization Plan, including Benjamin Feldmann of Mia Lehrer + Associates (who wrote the LARRMP), and received feedback from LA experts professor Bob Harris (USC) and David Gray (downtown architect/developer) at Ehlrich Architects’ office. The studio was confronted with the notion - what is a site within this changing infrastructure and how can the program feed the intent of the larger masterplan? The work produced in the studio will be examined in two ways – as a determined response to the program, structure/systems, materials, and context and as a means to engage students with the complexities of existing infrastructure. Building on an unfinished trajectory in the landmark 1969 short film Swamp by Robert Smithson and Nancy Holt where nature pushes back on a presumed act of geometrical purity, 59 Trees examines a 200 foot segment of a line of latitude in a central Missouri forest where the act of surveying becomes spatial. Genevieve Baudoin's paper, A Matter of Tolerance, can be found in the Proceedings to the Conference, available here. http://www.lulu.com/content/paperback-book/2015-fall-conference-paper-proceedings/18694636. Abstract: Tolerance exists between the lines of a drawing, but it is virtually the only way to ensure a building can be created on site. It can also be seen as something outside the control of the architect – a building is contingent on the tolerances supplied by manufacturers and agreed upon with contractors. As Francesca Hughes writes on the Architecture of Error, “Architectural practice is all about serial translation and serial approximation, whose action must nonetheless remain invisible if it is to serve up the seamless correspondence between idea and form, drawn or built, it promises.” The gymnastics of designing for or with tolerance is typically done behind the scenes so that the representation of the building (idea) and the building (form) appear the same. This essay will explore architects with a particular insight into tolerance, and who seek to maintain control of the parameters of variability inherent to the design of construction through details. The work of architects including SHoP, Kieran Timberlake, and Frank Gehry will be considered for their attitude towards and understanding of the nature of tolerance. Their work will be studied from built object back through the design process, examining the ways in which tolerance is tied to tectonic expression, where the parts (and what lies between them) facilitates the whole. Francesca Hughes, The Architecture of Error: Matter, Measure, and the Misadventures of Precision (Camridge, MA: MIT Press, 2014), 12. Baudoin's first book Interpreting Site is in print and available online! Interpreting Site: Studies in Perception, Representation, and Design was published by Routledge Press in the United States in June 2015. It is currently available through Routledge and other book retailers including Amazon. The book is intended to address some basic methods architects use to translate their perceptions to a representation of the complex conditions that physically and mentally “construe” the site, helping to shape the final design. The overarching intention behind introducing the methods and processes within this book is to develop an open-ended discourse, carefully considering the relationship between site and architecture through its representation and artifact. The book is arranged under four broad themes: Defining Site, Experiencing Site, Spatializing Site, and Systematizing Site, offering both students of architecture and aspiring architects a foundation to develop their own approach to the conditions of a site and a final design. Prototypes for the River: Proposals for the Los Angeles River is a compendium of the work produced in the 5th year studio in spring 2015 co-taught by Baudoin and Steven Ehrlich, Visiting Regnier Chair 2014-15. The entire studio traveled to Los Angeles in February 2015 to visit Ehrlich's firm, gain feedback from experts, see major architectural landmarks in the city, and travel 25 miles of the Los Angeles River visiting their chosen sites. Ehrlich also visited and worked with the studio in Kansas multiple times from October to May. The studio developed projects along the LA River against the backdrop of the Revitalization Plan recently implemented. Dain Susman also won the Heintzelman Prize, awarded to a student in their final semester of the architecture program at K-State for outstanding individual design achievement, for his project titled "The Triangle." Please contact us if you are interested in obtaining a copy of this book. Rise 2015 – The Contest of Meaning is the inaugural journal published by Women in Design – Kansas City. This issue explores the values and dilemmas of decisions designers make. “In the Trenches: On Collaboration and Recognition,” examines the difficulties of recognition when collaborating in design, looking at the recent press regarding the Pritzker Foundation’s decision on Denise Scott Brown and her recognition with Robert Venturi’s award, as well the challenges both the Vignellis and the Eames have faced in the public’s eye, as well as our own experiences as a partnership. Oz volume 36 examines Complexity – how designers acknowledge, analyze, generate and celebrate this condition. “Hypothesizing a New Case Study House Program: A Systems Approach” considers two projects from Dual Ecologies – Case Study One: Kansas City-Cul de Sac and Case Study Two: Albuquerque-Princeton Pump and their relationship to the existing water infrastructure, neighborhood fabric, tectonics and the ground on which they sit. A capstone competitions based studio at the University of Kansas led by Bruce Johnson, earns 3 spots in the Arid Lands Institute: Drylands Design Gallery. The work of students, Fritz Helbert (Skylab II) http://aridlands.org/discover/gallery/piggyback-infrastructures, Ryan Otterson (Ground Refinery) http://aridlands.org/discover/gallery/watershed-architecture, and Lindsay Brisko (Nomad Recharge Station) http://aridlands.org/discover/gallery/performative-public-space is featured and was additionally showcased in a traveling exhibition. As a competitions based studio, students selected and completed an average of four competitions per semester working within the establishment of their individually developed design tenets. Johnson presents two papers at the Reclaim + Remake : Waste is a Resource in the Wrong Place and Time National Symposium which focused on projects that used reclaimed materials as primary design driver. Paper 1 - "Blanc House: Rewriting the Structural Genetics of Stick Framing with Post-Consumer Based Materials" examines more normative reused materials from the construction industry (i.e. dimensional lumber, OSB and glass) as they are adapted for use in an 1800 square foot home, and Paper 2 - "Reclaimed Material and Disaster Housing: The Benefits of Hollow Structure" examines less conventional material reuse (i.e. PVC Billboard Fabric and PVC tubing) as they are reclaimed in the fabrication of a series of prototype student built emergency relief shelters.